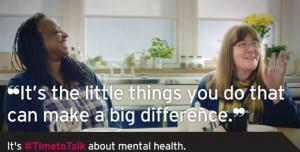 Today marks the first ever Time to Talk day organised by the charities Mind and Rethink Mental Illness – two of talkhealth‘s charity partners who supported our Online Clinic on Mental Health with NHS Choices back in October 2013. The aim of the #TimetoTalk campaign is to help break the stigma and discrimination that many people who have mental health issues experience every day. Nine out of ten people who acknowledge they do have some kind of mental health issues experience such treatment on an ongoing basis. You may say well it’s nothing to do with me, but you may be surprised to learn that one in four of us in any given year will experience a mental health problem. People that we come in to contact with on a daily basis may be going experiencing these issues without us knowing…. it’s just not something that is always openly talked about…yet! Today’s objective is to start as many conversations as possible around mental health issues – to empower people with mental health problems to feel confident to talk about the issue without facing discrimination. To find out how you can get involved visit Time to Change – get involved. For NHS Choices information on mental health issues – visit our talkmentalhealth hub. You can also start a conversation, or join an existing one in our mental health forum . If you have a story surrounding your experiences of mental health that you would like to share with others get in touch by emailing us at info@talkhealthpartnership.com and we will get it published on the website. Have a look at the stories that people have already written for us in the Your Story section of talkmentalhealth. By talking to others and sharing your story we can all help to beat stigma and discrimination and very importantly help to make better lives for everyone.